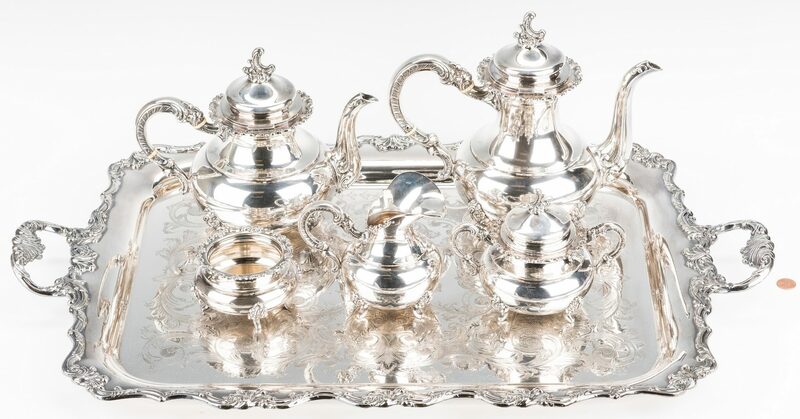 German 5-piece sterling silver coffee and tea set by Gayer & Krauss including coffee pot (9 1/2" H x 10 3/4" W overall x 6" D), teapot, both with hinged lids, cream pitcher, covered two-handled sugar bowl and waste bowl. 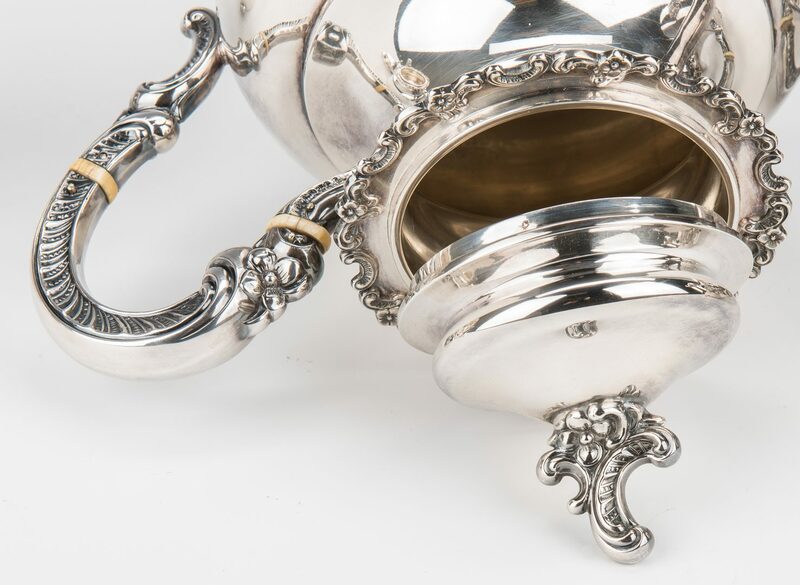 All with spherical top and bulbous base, c-scroll and floral handles and finials (excluding waste bowl) and rim. Each raised on four scroll and floral feet. 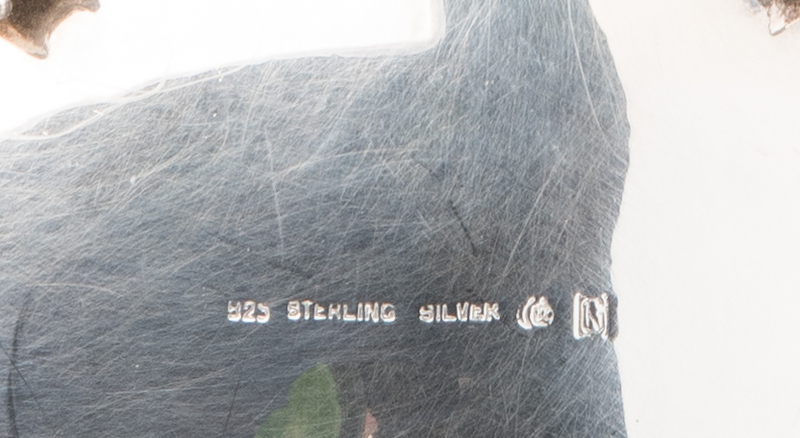 Marked on base 925 STERLING, half-moon, crown and maker's mark. 62.94 total oz troy. All but waste bowl with monogram "RJL". 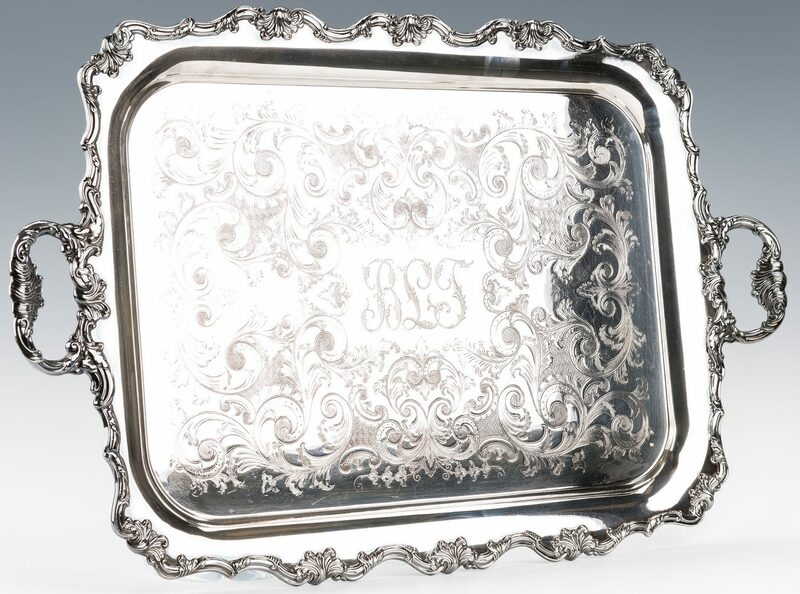 Set also comes with rectangular shaped two-handled tray with shell and scroll inscribed and applied decoration and marked on base, Poston Products Ltd, Londsdale Silverplate, Sheffield England, 2" H (handles) x 24" x 18 3/4" plus 2 1/2" handles. Monogrammed in center "RLJ". 6 items total. Provenance: Private Maryville, TN collection. 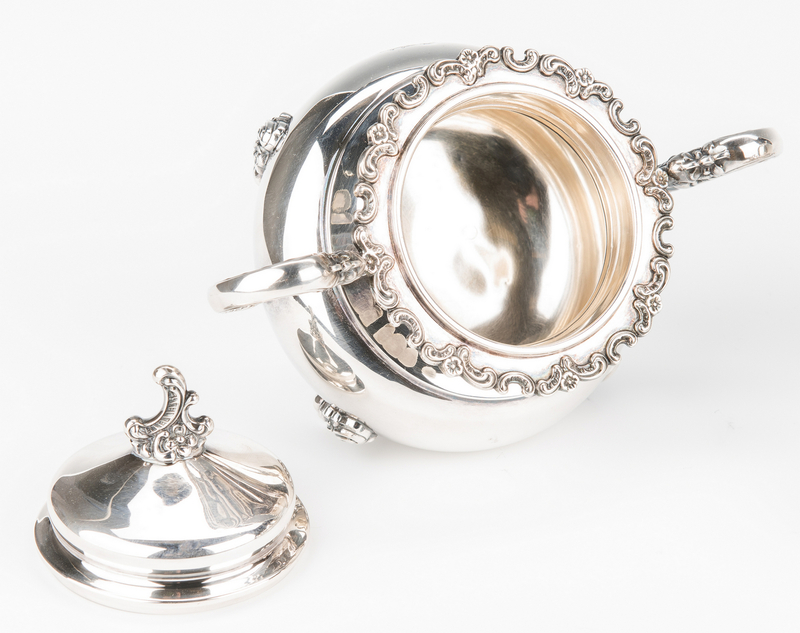 CONDITION: Sterling tea and coffee set in overall good condition. 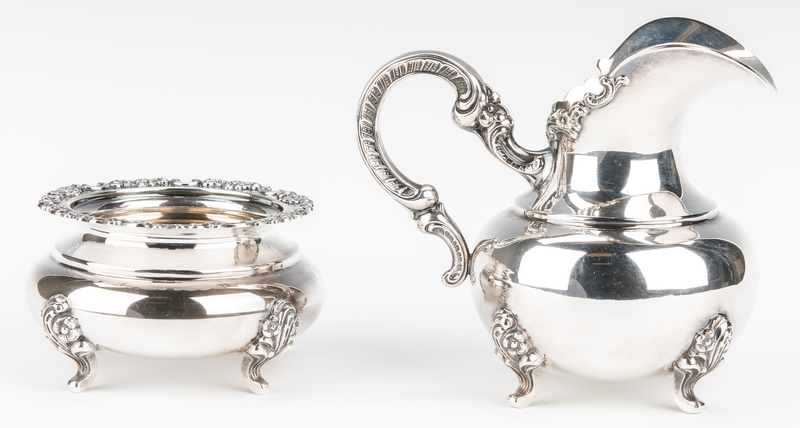 Tea pot, covered sugar and creamer each with one small dent. 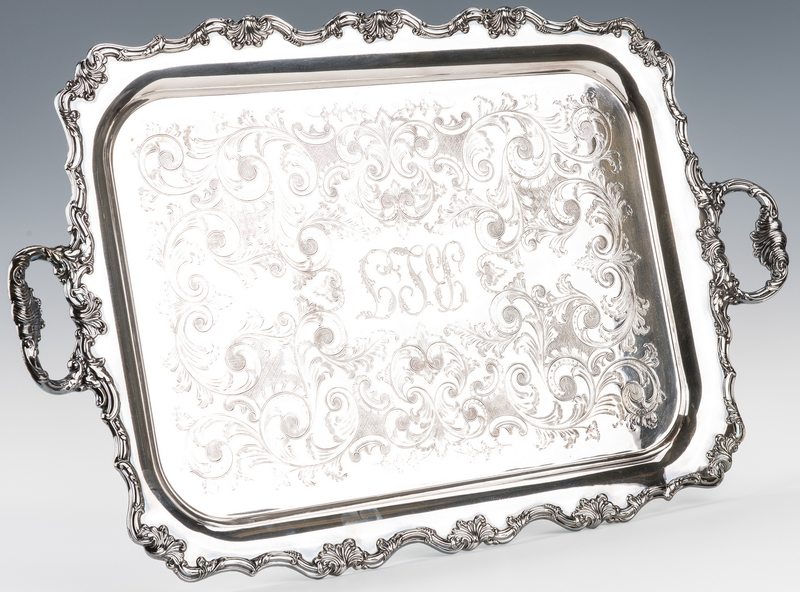 Silverplated tray in very good condition. All items except waste bowl are monogrammed.